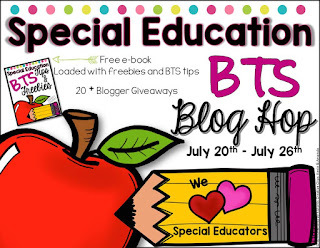 Back To School Blog Hop - Sped Edition with free E-Book - All Things Special Ed. 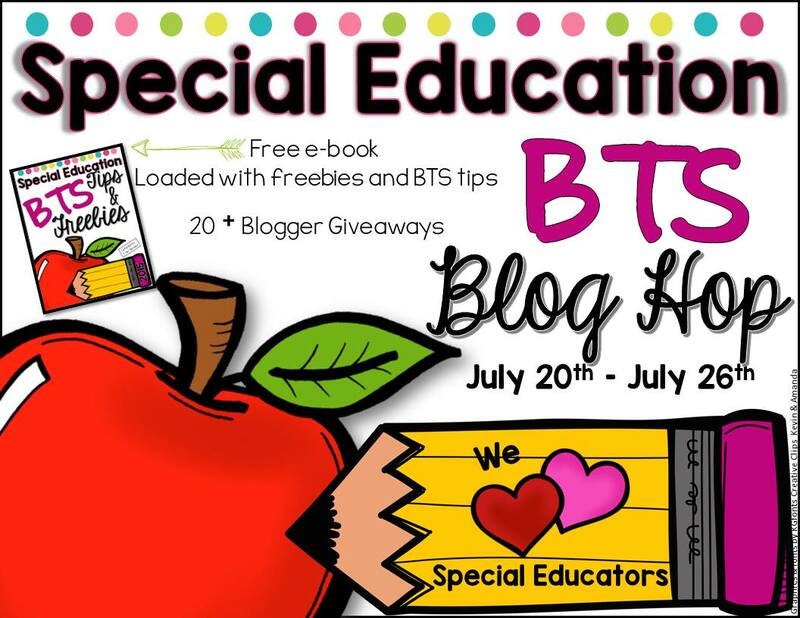 Welcome to our Special Education Back To School Blog Hop! 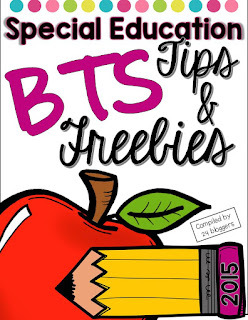 Download your free copy of the e-book below and get BTS tips along with tons of freebies from 25 special educators. Also, don't forget to hop on over to everyone's blog and to say thank you for stopping by- everyone is hosting thier own giveaway on thier blog. That is 25 chances to win 25 prizes! So keep hopping and don't forget to register for all the giveaways! Included in the e-book are 2 of my free products. One is an "IEP at a Glance" form that I created to keep me organized and to see what the year will look like in terms of my IEP meetings. I like to write down all my IEP due dates at the beginning of the school year so I know just when I need to schedule IEP's and if I have a lot that are in a short time space so I can space them out. I also included a new product that is free (now and through the month of September) called, "Back To School Noun Sort." In this 30 page back to school themed noun packet, you will receive everything you need to sort nouns into person, place, or thing using a pocket chart and a student recording sheet. I also just added a student edition where students have mats and colored sorting cards to sort on thier own- small groups, literacy center, or 1-1 as well as a recording sheet to write their answers down. Plus you will receive a B/W worksheet for students to cut, sort, and paste. So download you e-book and collect all your freebies and tips. Now- as to say "Thank you" for stopping by my blog, "All Things Special Ed." please participate in my blog giveaway. One lucky person will receive a $25 gift certificate to Teachers Pay Teachers! Who couldn't use that to stock up on all your goodies you want to start the year off right! If you are having trouble with missing pages, make sure you download the document (mine pops up in a preview and not all pages are popping up for me) and that should take care of the problem- seemed to only happen to me and one other person... good ol' technology!! I just spent $100 at the Dollar Tree in the last few weeks- loving the color of their bins and wanted to stock up!! well as useful. You people are doing an incredible job.